This Bean Head Suffolk Latch has been crafted by hand in the Traditional way of English Blacksmithing, a process known as Hand Forging. Natural Black Iron with a Beeswax Finish. Each Latch will never be exactly the same as one another, which is a Characteristic lost in modern mass production. For ease of fitting, our latches come with a "screw on" staple rather than the "Hammer in" style. 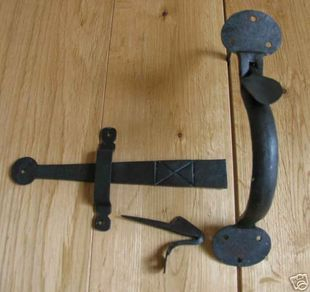 Adds Authentic Charm to any Ledge & Brace Doors.